Water Coolers: Productivity Enhancers or Destroyers? One of the most iconic appliances featured in an employee break room is the water cooler. This break room fixture is so common that it has inspired business jargon terms such as "water cooler conversations" or "water cooler gossip." Some business owners may hesitate to place water coolers in their break rooms. While these devices are beneficial because they provide hydration to employees during working hours, there are some potential drawbacks to these pieces of equipment. As an employer, you must decide whether a water cooler is a p roductivity enhancer or destroyer. First, water coolers are much healthier than vending machines that are stocked with sugary soft drinks or artificially sweetened diet beverages. Drinking pure water is the healthiest thing you can do, especially when you are working long hours and sitting at a desk. Many health experts believe that the purified water contained in water cooler jugs is preferable to water that is poured from the tap. Tap water may contain trace elements of minerals and impurities that can be harmful to health over time. Pure water also has a better taste than tap water because these imperfections and impurities have been removed during the purification process. Without a doubt, adequate hydration is crucial to high productivity levels in an office. Without hydration, workers may develop headaches, nausea, or fatigue as the work day progresses. In some locations, business may be required by law to provide their employees with a source of pure drinking water. There are, however, some cons associated with water coolers in break rooms. 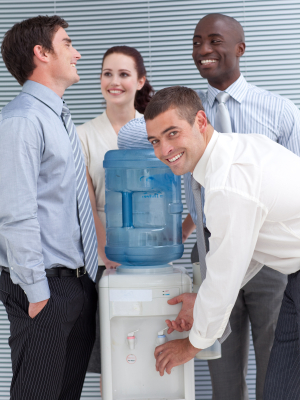 The concept of "water cooler gossip" is derived from a common practice in many break rooms. Employees may tend to gather around the water cooler and discuss topics not related to work. This can be a time waster, and if the behavior is not regulated, it can quickly get out of hand. If you decide that the pros associated with a water cooler outweigh any potential cons, then you will need to select the right one for your office break room. The simplest water cooler, besides tap water, is actually not a cooler at all, but rather it is a water dispenser. A water dispenser does not use energy or electric power to operate. Instead, the water dispenser operates using gravity. A large jug of water is placed upside down in the cradle of the water dispenser. When a spout handle is depressed, a lever releases the water and allows it to flow into a waiting cup. This water is usually room temperature as there is no cooling mechanism. Another type of water cooler is one that is electrically powered. These water coolers have a heating and a refrigerating component. They can be used to make hot tea or hot cocoa in colder months or provide your employees with an ice cold glass of water in the summer. Most employees prefer the versatility of an electric-powered water cooler, so when thinking about providing cold water, you'll score big points with your workers if you invest in one.